The ‘List’ function in TargetMine enables queries on user-supplied list(s) of objects (e.g., a list of genes/proteins). The user may either save lists from results pages or create them by uploading lists of identifiers. Lists can be used to constrain queries – either a template query or in the query builder, to perform logical operations (union, intersect, subtract) and exported. The users may also search and copy the lists. 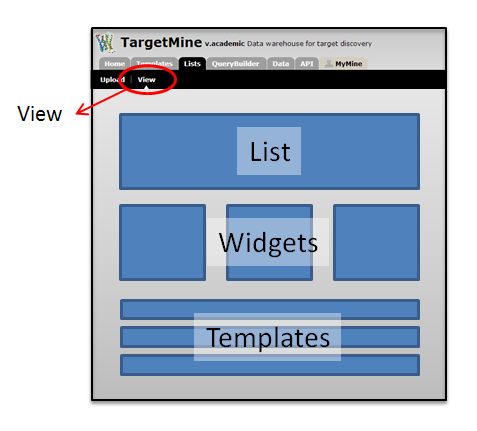 The Lists page is accessible via the ‘Lists’ tab on the TargetMine menu bar. You can view your existing lists in the ‘View’ tab. You can find all your lists in the ‘View’ tab. 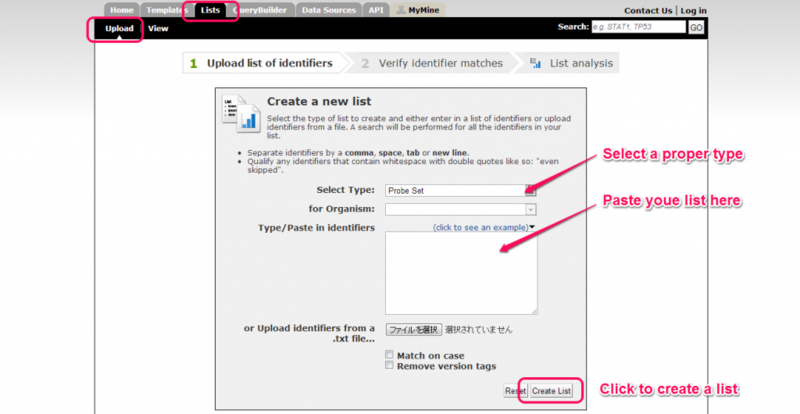 The ‘Upload‘ tab in the Lists page permits the user to create a list of objects either by ‘Type/Paste in identifiers’ or upload a file containing a list of objects. Click on the ‘List’ tab and choose ‘Upload ‘ to upload a list. A list can be created of only one ‘type’ of objects (e.g., genes, proteins), which can be set from the drop-down list. However, it is possible for the list to contain a mix of identifier types (e.g., gene symbols and gene IDs). Optionally, the user may also set the organism for the list of identifiers. Before a list is created it is checked against the TargetMine database and any discrepancies are reported in the ‘Verify identifier matches’. The user may either assign a name to the list or use the default name generated by the system. Assign a name to the list and click save. Details of the contents of the lists together with additional information about a list can be viewed through the ‘List Analysis’ page. The analysis page is automatically displayed when a list is created. It can also be accessed at other times by visiting the ‘View’ in the ‘List’ tab, then clicking on the list name. List Analysis page consists of 3 sections; a list summary, widgets and templates. A summary of the contents of the list includes a table with the objects of the list, a list description, List Info, Convert tools and Link outs (if available). A series of ‘widgets’ providing more information about the list, for example, overrepresented KEGG pathways, Gene Ontology (GO) terms, compounds and Disease Ontology associations and CATH classifications. A set of template queries that have been pre-run on the set of objects in the list.